Morning everyone! It feels like ages since I've done one of these posts & I think I'll get back in the habit of doing them more often. There's plenty of fantastic blogs out there that deserve to be shared. You'd have to have been hiding behind a well constructed rock though to have not heard of this month's brilliant blog Someone Like You. Lauren pens a fashion blog with diary-like entries about her everyday life. It is without a doubt the most refreshing, honest blog that I have ever read. It's very inspiring to read and Lauren's pictures are always beautiful to look at as well. What made you decide to start Someone Like You? What do you love most about blogging? -I was really bad at writing in my journal every night, but I still wanted a way to document my life. I thought that writing it on a blog might be easier and more convenient! Around that same time my English teacher told me I should start documenting my every day outfits to see how my style evolved so my blog turned into a personal writing+fashion blog! What I love most about blogging is hearing from people who read my blog. Incredible stories, testimonies, thoughts from real girls and guys all over the world. I cherish everyone who reads my blog so very much and they're all like my friends. What is your favourite clothing item or accessory that you own? -So, so, so tough. I would have to say a lace 1940's prom dress with a boat neckline, complete lace back, and pleated skirt. I got it for $20 (such an insane steal!) and wore it for my senior pictures. It'll always be my favourite because it takes me back in time. Which blogs do you like to read? -I like to read blogs that are honest and readable. Sure, the big, fancy blogs with thousands of followers are nice, but they're not relatable. People's lives aren't like that in real life. I love any relatable, real blogs where people share their personal life and struggles. Those are the best because it feels like I actually know the person. -For being a fashion major I should really keep up more with designers and stuff, but sadly I don't. I do fancy Christian Dior though; the house's designs are always wonderfully vintage inspired. Which is your favourite post that you've done so far and why? -From a writing standpoint, I think the one where I wrote about my breakup when it first happened. It's so real and I can't even go back and read it now because I was so honest and truthful about everything. It took a lot for me to write about it and publish it. From a fashion standpoint, it's this one right here from June 25th, 2010. It's not the greatest outfit, photography or posing, but it was the first fashion post I did for my blog where I fell in love with blogging and taking pictures. I remember that feeling of wanting to do this forever and it is a truly irreplaceable feeling. Whenever I start to get tired of blogging, I think back to that first feeling of exhilaration and it keeps me going. What is your favourite beauty product? Probably either the one on my blog header, 'be who you are and say what you feel because those who mind don't matter and those who matter don't mind'. Or a Bible verse: Out of my distress I called on the Lord and the Lord answered me and set me free. Psalm 118:5. Finally, when you aren't blogging what do you do? It sounds like such a boring answer, but I am so excited to put this! Hanging out with friends. Before college I didn't have a group of friends to hang out with and go on adventures and do silly things. I cherish all my friends at college here and spend a lot of time with them because we only get the school year together! ♥ Thank you so much for answering these questions for me Lauren! Be sure to go and read Lauren's blog everyone and share the like love on her Facebook page x.
I'm so glad you picked Someone Like You to share on your blog :) Lauren's a great writer and has a wonderful way of putting outfits together! 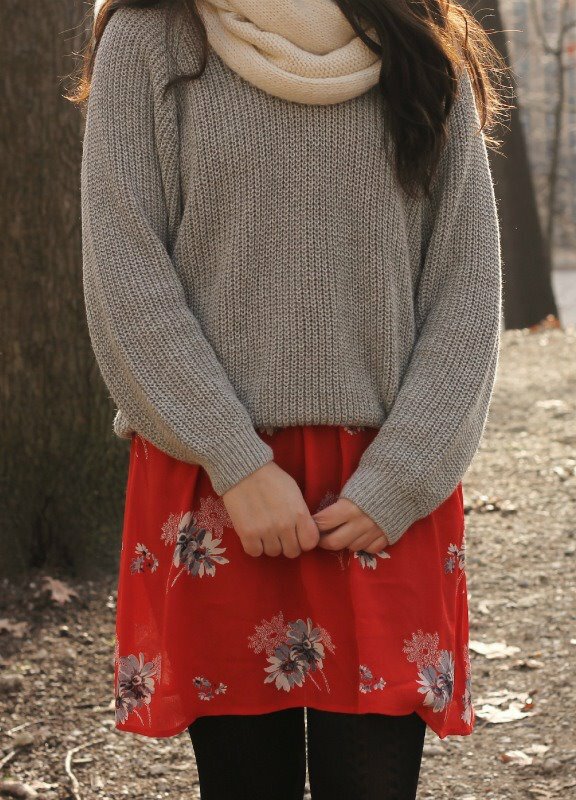 I love Lauren's blog :) she has such a fantastic eye for fashion & her writing is amazing x.